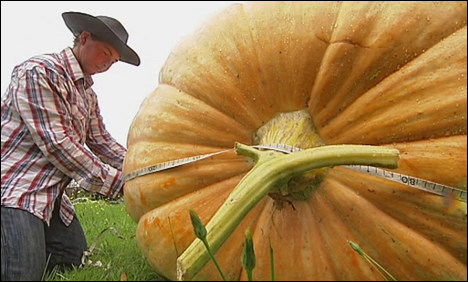 SYDNEY: Australian farmer Phillip McCauley has grown a massive 385.1 kg pumpkin in his farm. The dairy farmer from Cora Lynn, Victoria, says he has given up on gourds now after growing a piffling metre-long one, and quit with the huge tomatoes too. In the extreme vegetable world, the Atlantic Giant pumpkin stands tallest. It is the biggest thing going and Phillip's best shot at glory. And after growing Victoria's biggest ever pumpkin, a 385.1kg monolith that has smashed the old record by 130kg, the Cora Lynn dairy farmer is ready to take on the world. A 200mm rain dump three weeks ago forced Phillip to pull up his pumpkin, dubbed "The Big One''. It was a third under water. Queensland's record is disputed between a pumpkin grown by LNP backbencher Lawrence Springborg's 304kg effort and a 330.4kg by Toowoomba horticulturalist Clinton McGrath.